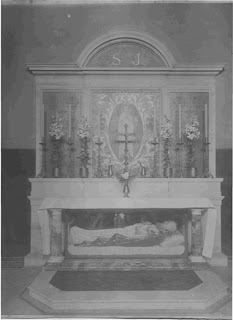 Fr Oakeley set up an altar to St Francis in 1850, and in 1851 obtained for the chapel from Pope Pius IX the Plenary Indulgence of the Portiuncula. 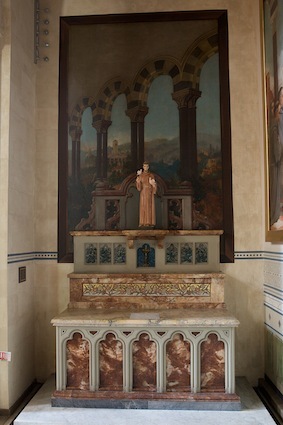 At that time, there were few Franciscans in England, and the chapel must have been one of the earliest Post-Reformation Franciscan shrines. Edward Armitage, an important Victorian painter, provided two large canvases on the side and back walls. 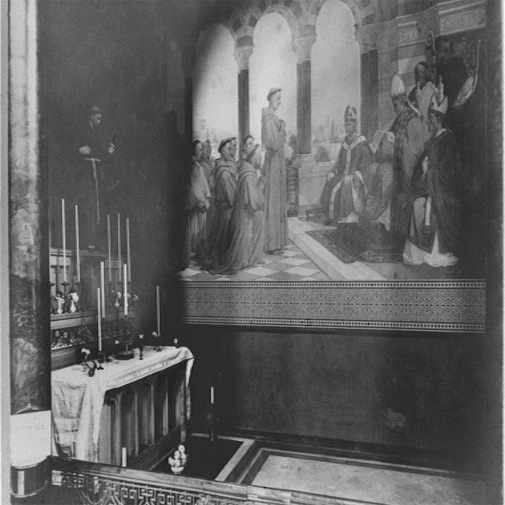 The Institution of the Franciscan Order was painted in 1887 to replace an earlier fresco, which had decayed. It shows St Francis receiving confirmation of the rule of the order from Pope Innocent III. The richness of the clothes and the jewels of the mitres and tiara contrast with the poverty of the Franciscan habits. 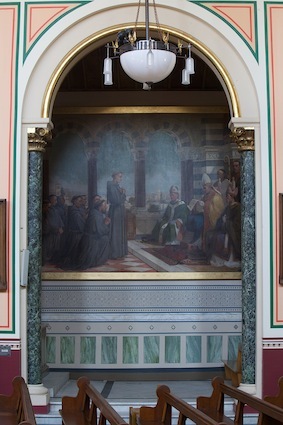 On the back wall of the chapel is a painting of the meeting between St Francis and St Dominic, founder of the Order of Preachers. They lived at the same time and both founded new religious orders: the Franciscans famous for their humility and simplicity of life, and the Dominicans for their scholarship and zeal. The two paintings highlight the universality of the Catholic Church, home to the rich and the poor, to the simple and the intellectual. 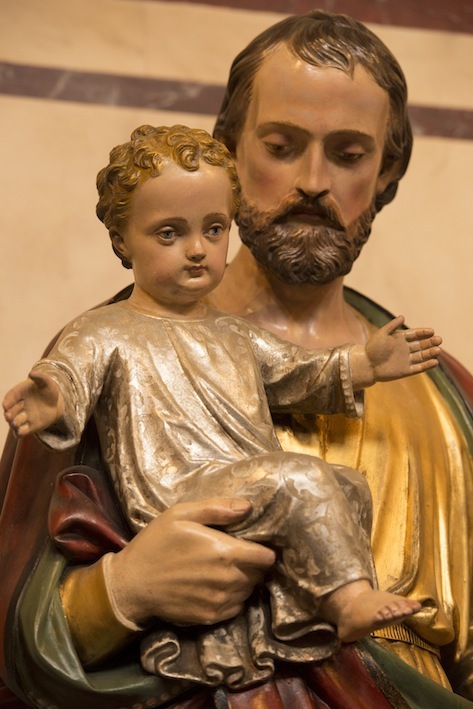 The fine statue of St Joseph shows him as patron of the Universal Church, holding the Christ child. 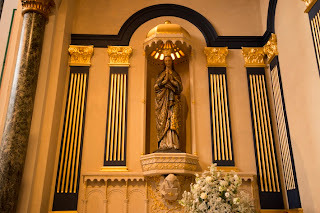 The statue was the gift to the parish from Cardinal Bourne. It had stood in the parish of St Mary’s Horseferry Road. The chapel contains tablets, which commemorate the first three rectors of this parish. 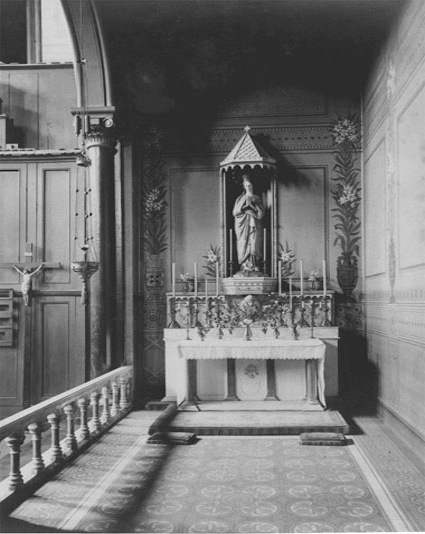 The statue of Our Lady is German and was brought to the church in 1850, probably from Munich. It attracted anti-Catholic protesters in its early days, but was also the subject of great devotion. 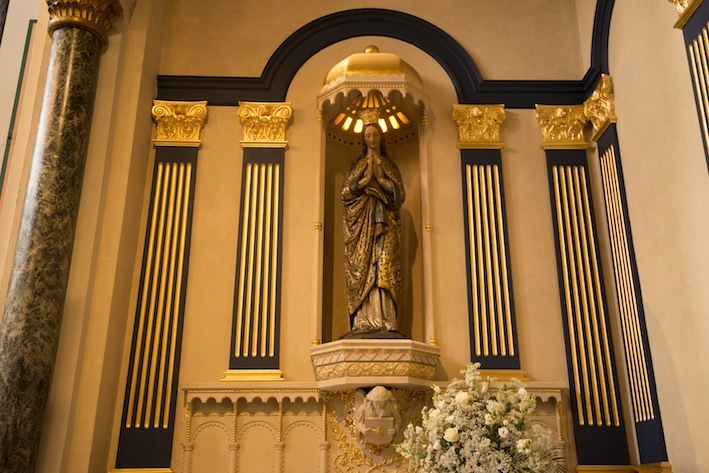 Indeed, one Maria Dobson made a solemn deposition in 1851 that she had seen the Madonna move her eyes, prompting her to convert to Catholicism. The main altar of the church was placed here in 1973. 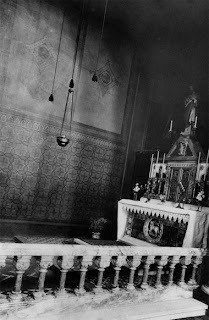 It is decorated with symbols popular at that time, reproducing those used in the early days of the Church. The bread and fish at the centre, five small loaves and two fish, remind us of the feeding of the five thousand. The anchors at either side were symbols of hope, safe haven, being sheltered in port. Note the bottoms of the anchors are letters, an ‘A’ the first letter of the Greek alphabet, alpha, and what looks like a ‘w’ is, in fact, a small omega, the last letter of the Greek alphabet. In the book of the Apocalypse Jesus says, ‘I am the Alpha and the Omega, the beginning and the end.’ The birds are most probably a representation of the quail that fell into the Israelite camp as it dwelt in the wilderness after leaving Egypt. The small crosses are traditionally the representation of the manna, also known as the bread of heaven—the small sweet flakes which settled on the Israelite camp. The quail and bread helped to feed the children of Israel for the forty years of their wanderings in the desert. 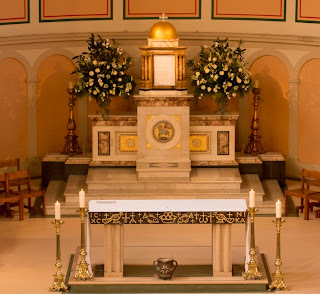 The IC at one end of the altar represents the first and last letters, in Greek, of the name Jesus. The XC below are the first and last letters of the name Christ. At the other end, the word NIKA is the Greek for ‘victor’ or ‘conqueror’. 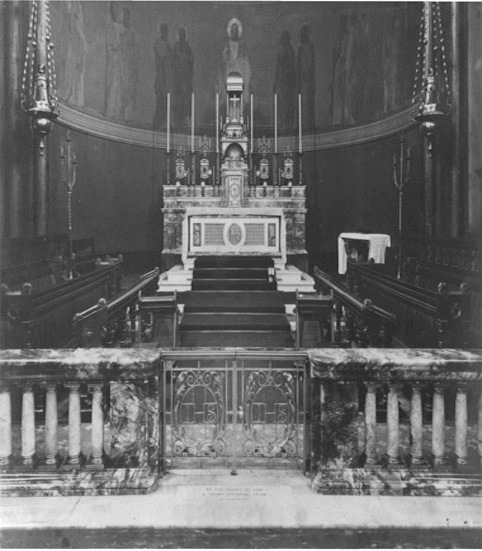 The tabernacle is set upon a reduced altar of marble. A mosaic of the Lamb of God is set in the central round panel. To the left-hand side is a mosaic of the X and P joined, a frequent shorthand for the name Christ. It is thought to be the symbol which the Emperor Constantine had painted on the shields of his army, when he heard the words ‘In this sign conquer’. On the other side, we see the letters Alpha and Omega again, this time entwined. In the dome of the apse the painting of the Transfiguration of our Lord was executed in 1963. On the right of our Lord is Moses holding the tablets of stone which contain the Ten Commandments. On the left is the figure of Elijah, his mantle, which will one day fall to Elisha, flowing from his shoulder. Beneath the painting we see the word uttered at the scene: ‘This is my Beloved Son in whom I am well pleased. Listen to Him.’ These words join the baptismal font and the altar—the two main focal points of the church. The walls were first painted by H.A. 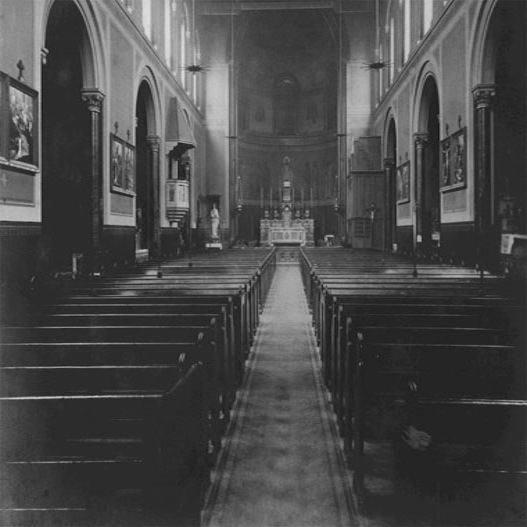 Bulmer in the 1850s at a cost of more than three times that of any of the other chapels. The patterns are very like those used by the architect Pugin. The amount of gold paint used makes it somewhat richer than usual. 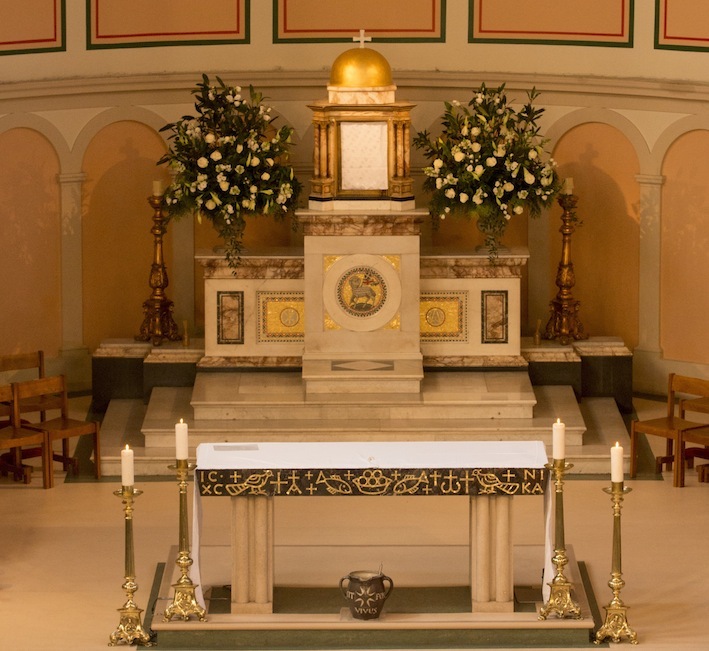 The altar is one of the finest in the church, with marble patterning and carvings. The heads represent the four Evangelists, the angel for St Matthew, the lion for St Mark, the ox for St Luke, and the eagle for St John. The Lamb of God at the centre reminds us of the words ‘This is the Lamb of God’ used by St John the Baptist of Jesus and repeated before Holy Communion in every Mass. In penal days, St. Cuthbert Mayne was arrested for having a Lamb of God medal about his neck, and was later executed. Even in the 1850s, when the church was decorated, there was some prejudice against this symbol, some referring to it as the ‘Pope medallion’. 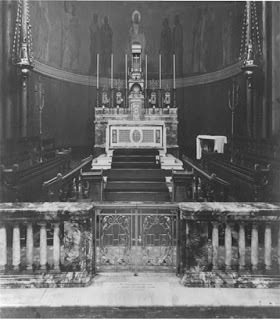 The tabernacle set upon the altar is carefully decorated with corn and bunches of grapes, as also is the back of the altar, the reredos. 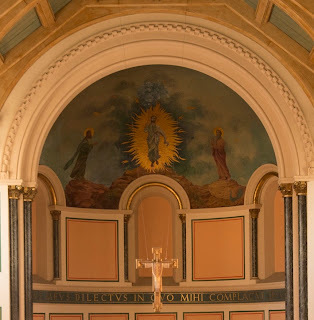 On the plinth above the altar is a statue of the Sacred Heart of Jesus. Around the church are fourteen paintings, which show our Lord’s last journey. The paintings come from Belgium, from around 1880, and were placed here by Canon Pycke, the second Rector, a native of Belgium. 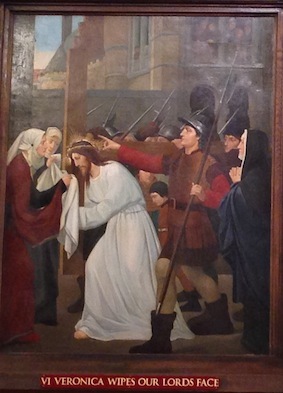 At that time, many restorations of the great Belgium churches were taking place, and sets of ornaments were produced in an antique fashion to recreate the golden age of Flemish art, the 15th century. This is one of those sets. Note especially the clothes, the armour, and the weapons of the soldiers as well as the buildings in the paintings.